A bigger, more complete Sue the T. Rex will be back on display soon at the Field Museum. Since making way earlier this year for Maximo, the Field’s new 122-foot-long titanosaur, Sue has been behind the scenes undergoing several changes to account for new scientific discoveries since the famous dinosaur arrived at the museum nearly 20 years ago. Starting Dec. 21, visitors can see the updated version of Sue in the dinosaur's new 5,100-square-foot “private suite” within the museum’s “Griffin Halls of Evolving Planet” exhibit, the Field announced Monday. Sue’s new home will include interactive displays and animations showing how the Tyrannosaurus rex would have interacted with other dinosaurs and what their shared landscape would have looked like, said Jaap Hoogstraten, the museum’s director of exhibitions, in a statement. The move is the culmination of a decadeslong plan to display Sue in a proper scientific context that helps demonstrate why the T. Rex “is widely considered the greatest dinosaur fossil in the world,” Field President Richard Lariviere said in a statement. The addition of Sue’s gastralia is significant, given that the rib-like bones are rarely preserved in tyrannosaurs, according to the museum. 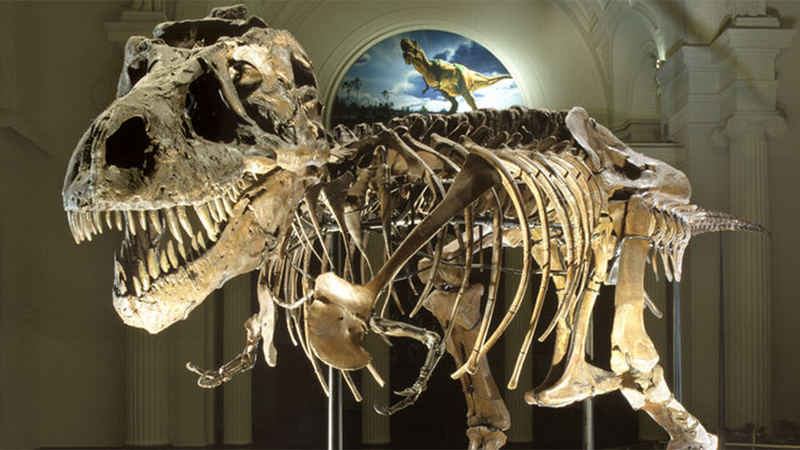 Scientists weren’t sure how to position them when Sue’s skeleton was first mounted in 2000, but research in the years since has helped them learn more about the bones’ function and placement. Gastralia are also present in ancient crocodile relatives and likely developed as a means of defense, though dinosaurs might have also used them to breathe, according to the Field. “We can’t wait to reintroduce Sue to the world,” Hoogstraten said in a statement. “Sue is the crown jewel of the Field’s collections, and now we’re finally showing them off the way they deserve.